Winkles from around the British Isles. There are four species of British winkle of the genus Littorina that can be readily identified on rocky shores. There are actually more species than this but for the general rockpooler it is only practical to identify the species in the chart below. This tiny species (4 mm) lives high up on the shore and is almost a terrestrial animal when adult, but relies on the sea to disperse spawn and the larvae live for a short time as members of the plankton. There are at least 4 different species with the largest reaching 30 mm. They are to be found in crevices on the upper shore. The eggs are laid in pink jelly-like masses under rocks and the young winkles crawl out. This flat species lacks a spire and is found amongst the fronds of the Serrated Wrack and the Bladder Wrack which occupy distinctive zones in the middle to upper shore on rocky shores. Dark green and yellow specimens are common. Found in millions where left unexploited by man. Usually black or bleached grey by the sun, there are also striped and coloured specimens. 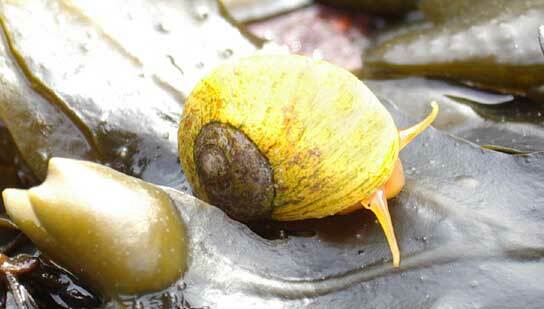 Winkles are herbivorous and graze on algae on rocks. In aquaria their feeding trails can be observed. They are resistant to desiccation at low tide, and possess a thin transparent operculum to seal off the aperture. They should not be confused with the topshells, which are superficially similar and common on the lower shore. The most widespread species is the Grey or Silver Top, Gibbula cineraria. A species called the Toothed Top, Monodonta lineata, from the south-west rocky shores lives in the same zone as the Edible Periwinkle.